A trio of Pennsylvania runners will make the trip to Portland, Oregon this week for Saturday's Nike Cross Nationals (NXN). All three qualified for the meet as individuals by placing in the top 5 of non-qualifying teams at NXR-Northeast at Bowdoin Park in Wappinger's Falls, New York this past Saturday. One boy -- Zach Kinne -- and a pair of girls -- Isabel Sagar and Jenna Mulhern -- will look to conquer the mud of Portland's Glendoveer Golf Course. Marlee Starliper, who won the Foot Locker Northeast Regional on the same day was invited to NXN as an at-large qualifier, but the Northern junior declined to focus on Foot Locker Nationals, scheduled for Saturday, December 8 in San Diego, California. 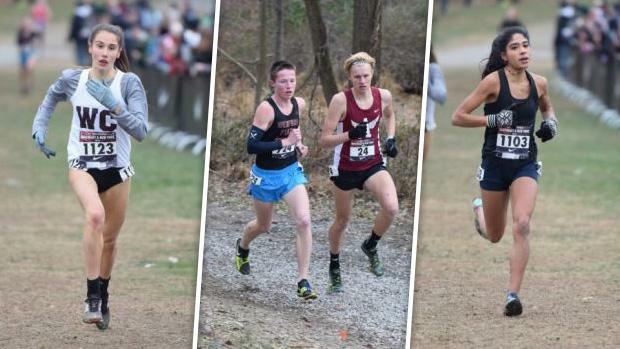 Let's meet the PA's three representatives at NXN! Scroll through meet the three NXN-bound athletes!